A must-have for every MRI diagnostician! MRI of the Knee is a comprehensive guide for investigations of the knee joint. It is provided with recent pictures and enables the reader to approach MR reporting of the knee in a practical way. Clinical aspects and a number of schematic diagrams make it easier to understand current trends in diagnostic investigation of the knee with MRI. All diseases of the knee joint are elucidated by top-ranking international authors in the 17 chapters of the book. It is suitable for reading and may also be used as a reference. Its modern and reader-friendly layout, created by University Publisher 3.0, complements the professional presentation of this bestseller. 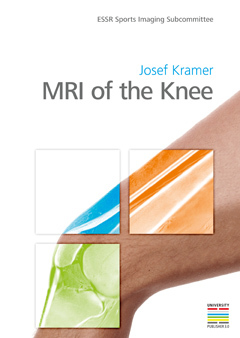 This book relates the current state of the science of diagnostic investigation of the knee with MRI. Recent trends in diagnostic investigation of the knee are interpreted by international experts. The modern picture material, consisting of more than 1,000 illustrations, has been prepared in an excellent manner for educational purposes. A large number of schematic diagrams and succinct texts serve to achieve a rapid understanding of the subject. This is a must-have for every MRI diagnostician. MRI of the knee is among the most commonly performed cross-sectional Imaging investigations and after decades of clinical use one would expect no significant new insights in this field. This, however, is completely contradicted with the book "MRI of the knee" edited by Josef Kramer and the Sports Imaging Committee of the European Society of Musculoskeletal Radiology (ESSR). The current knowledge of arthroscopy and other advancing treatment options for the knee is presented here by focussing on MR imaging. The book may be divided into four sections. In the first chapter, the anatomy is described systematically with respect to biomechanics and in such a great detail, that not only beginners, but also the experienced radiologist will receive some new information. The authors’ profound knowledge about the historical perspectives how morphological concepts evolved may open the radiologist’s eyes for a more thorough understanding of the daily routine reporting work. In the next five chapters, the major anatomic components of the knee with their typical injury patterns and how they appear with imaging are presented. Such, the kinetic chains of trauma, overuse and degeneration are discussed and footprint patterns of the weak chain links are described. Practice tips about how to avoid pitfalls reflect the authors’ great clinical expertise. A chapter about the children's knee contains all relevant topics of variants, congenital abnormalities, patterns of overuse, and common tumours in this patient group, One chapter is dedicated to juvenile arthritis with an extensive overview on quantitative imaging. In the remaining eight chapters, the authors deal with all major clinically relevant situations, i. e. trauma and instability, inflammation, swelling and malignancies. Typical and not so typical findings are presented in the context of etiology and biomechanics, thus supporting a more synoptic understanding of the disease processes of the knee. The figures are of excellent quality and many chapters contain long lists of up-to-date references. Searching for a peculiar detail or for topics discussed in different chapters within this broad spectrum of information – the postoperative knee is an example – may be difficult and we as readers hope for an e-book version in the near future. In summary, the experts of this ESSR Sports Imaging Committee have successfully managed to provide the reader with an update of the practically relevant knowledge necessary for daily reporting. The young publisher has shown us his high potential and power in how to realize a modern knowledge management concept in medicine.